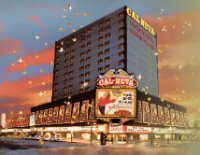 Club Cal Neva Hotel Casino in Reno, Nevada has a 65,000 square foot casino gambling floor with 1,200 slots, 50 table games, race and sport book, poker and hotel. Club Cal-Neva Casino is the locals favorite because they are reputed to offer a 99% payback on video poker. Table games: 50 tables playing all the popular games. Sportsbook: Place your bet and watch your favorite race or game.